The Belgium international is enjoying his best-ever season with the west London side and he has already contributed 16 goals and 12 assists in the Premier League alone. According to The Mail, the European champions remain keen on acquiring the services of the 28-year-old, but they are unlikely to match the Blues £100m price tag for the summer. Los Blancos are currently prepared to offer a fee in the region of £60m for the former Lille graduate and they are hoping that the playmaker will force through an exit from the FA Cup holders. 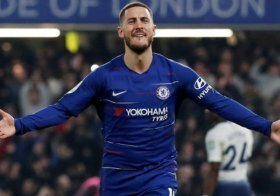 Hazard presently has 15 months remaining on his current deal with the Blues and reports have previously indicated that they could risk him for the final year of his contract amid the two-window transfer ban sanctioned on them by FIFA.